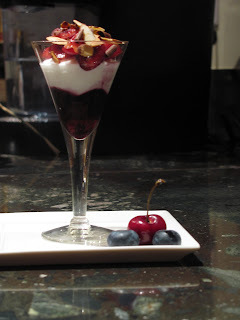 How about a nice red, white, and blue summer parfait? Protein from the yogurt, and the beneficial antioxidants from the blueberries and cherries combine to produce this sweet and healthy snack. 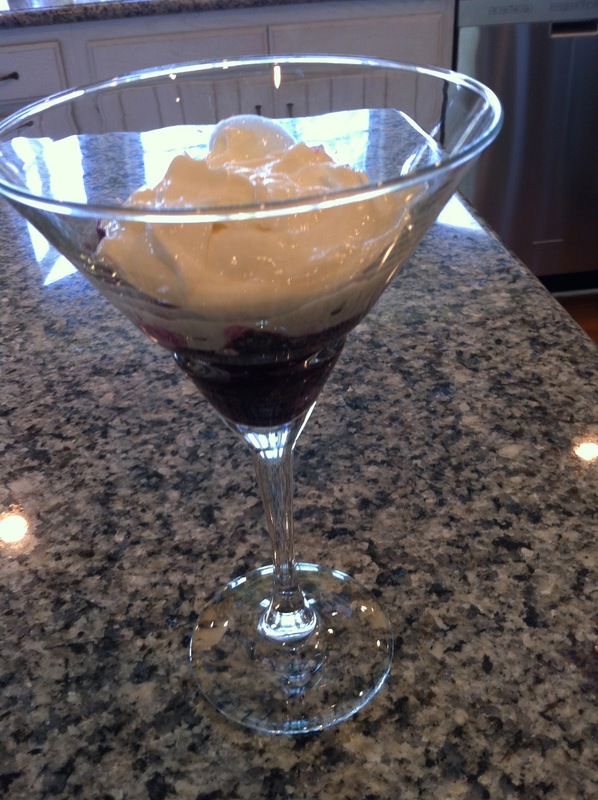 It is also a beautiful dessert for your Memorial Day or Fourth of July party. 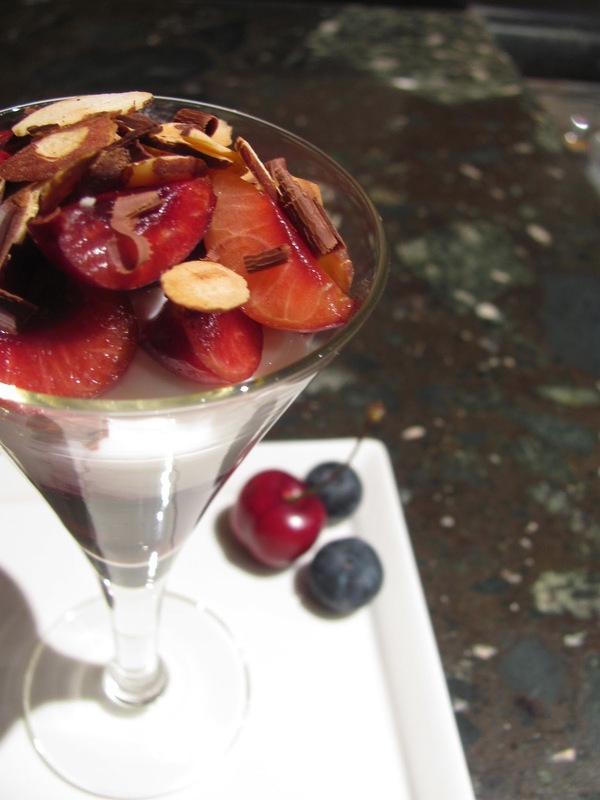 Not only do the colors of the fruits and yogurt remind us of an American flag, but both blueberries and cherries are rooted in history. Everyone associates cherries with George Washington chopping down the cherry tree. But did you know blueberries were an important fruit for American Indians in the northeast? 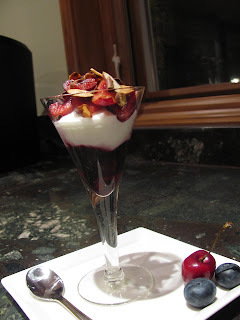 This parfait is best with fresh summer fruit, but if you cannot find fresh fruit you can use frozen ones in the off-season. With minimal preparation and ingredients needed, you will find this is a perfect snack or dessert for those hot summer nights. The parfait can be made without any cooking. 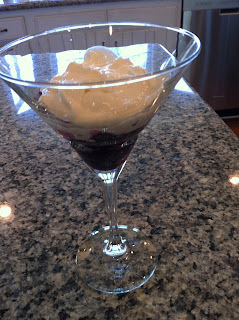 You can also choose to macerate the cherries in the Kirsch and marinate the blueberries in the honey ahead of time. Then just begin layering the fruits and yogurt. 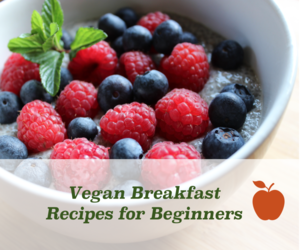 We suggest brief cooking, though, so the cherries and blueberries can release their juices. 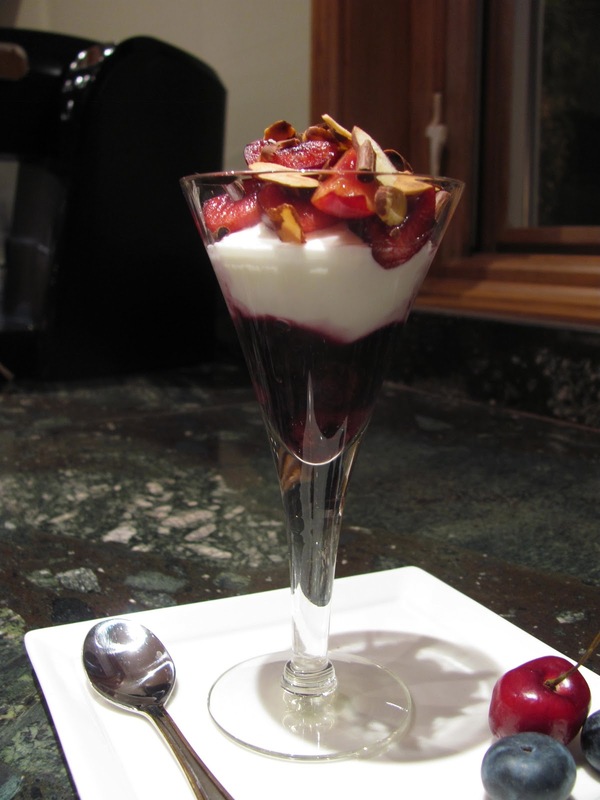 The combination of warm fruits on the cold yogurt is also a very interesting option. 1. Cherry sauce: In a small sauce pan, heat the pitted cherries for about 5 minutes on low heat, or until the cherries exude their juices. 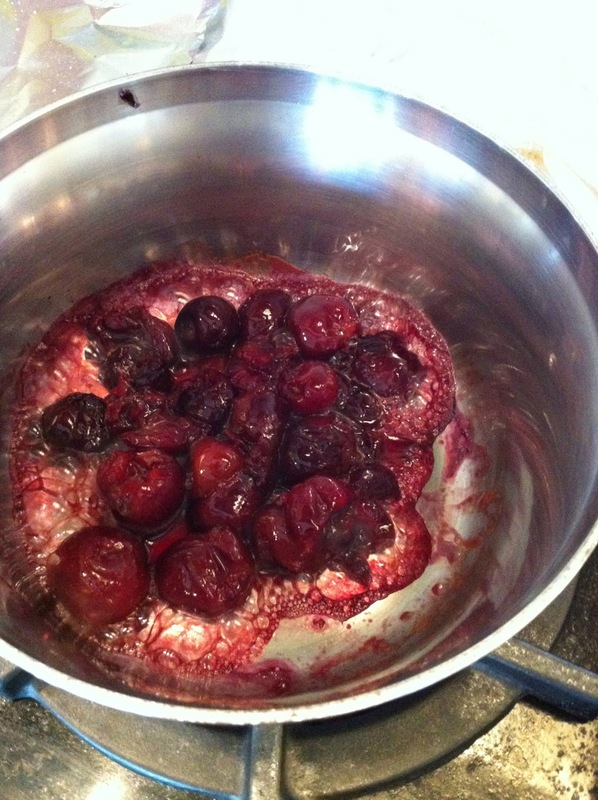 If cherries are very fresh add 1 tablespoon water before heating. Add the Kirsch or brandy after the cherries have been cooked and cooled somewhat. Taste and if too tart, add 1 tablespoon honey. Set aside. You can also choose to use the cherries fresh, if they are sweet, plump, and easy to separate from the seed. Earth Treats cherries are! Go to Shapeup.org to order. 3. Add 1 tablespoon honey to the Greek yogurt and stir thoroughly. 4. 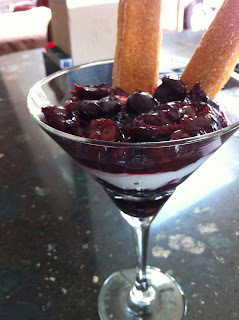 Assemble the parfaits, starting with the blueberry sauce. Then, top with yogurt, and finally cherry sauce. 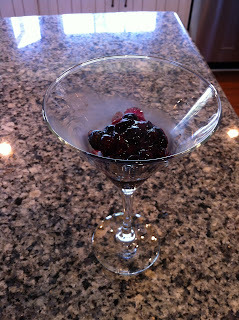 If using smaller glasses, repeat and end with a dollop of yogurt. 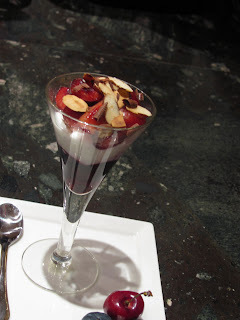 Top with a few dark chocolate shavings, 1 cherry with its stem, and serve with 2 ladyfingers or a sprinkling of granola. When layering, make sure to spread yogurt and sauces evenly out to the sides of the glass and make layers generous for a strong red-white-and-blue effect. 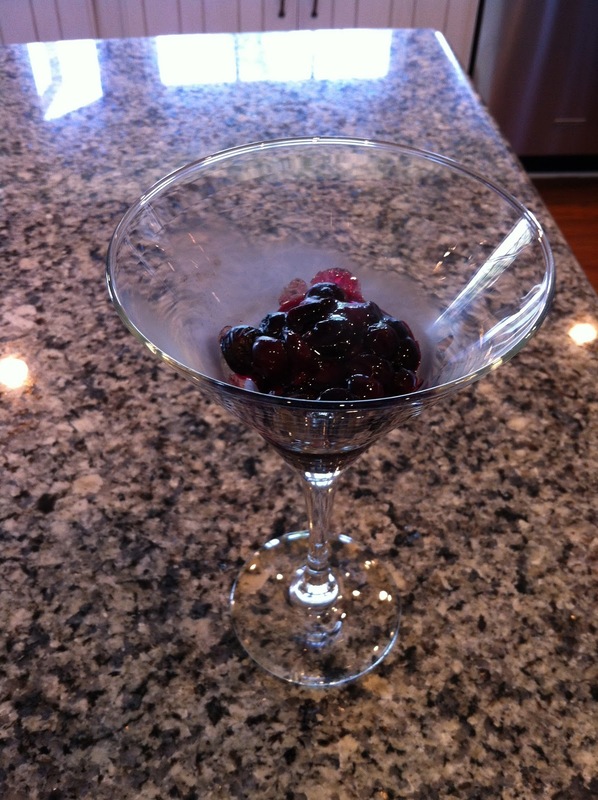 Use smaller serving cups to reduce calories and still enjoy a sweet bite!